When your dog is itching, but you have ruled out fleas, it can be hard to determine what to try next. Fortunately, there are steps you can take to help your dog feel better in both the short and long term. Just be sure to consult with your veterinarian to determine if your dog has any underlying health problems causing the itching, because if you do not address the cause, it will come back again later. Give your dog an oatmeal bath. You can buy oatmeal shampoo formulated for dogs that can help ease dry skin and relieve the itching. Let the shampoo sit on his skin for about 15 minutes before washing it off. This is not a permanent solution, but can temporarily provide your canine with some relief. Switch your dog's food to a hypoallergenic variety. Sometimes a dog itches because his immune system is reacting to a food allergy. Remove any stresses in your dog's life. If you just got a new puppy or a cat, your dog might be scratching in response to stress. A new family member or roommate can also stress out your dog. You might need to keep your dog separated from the new arrival for a while until he calms down. You could also ask your vet about anti-anxiety medications for dogs. Keep your dog indoors. 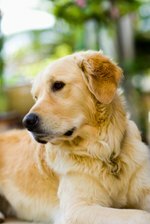 Dogs can get seasonal allergies just like people can, so this could be the culprit in your dog's incessant scratching. Keeping your dog inside helps keep him away from environmental allergens that make him itch. Provide your dog with a supplement to help his skin. Vitamin E, essential fatty acids and the B vitamins are all important nutrients for skin health in dogs. You can buy these at your local pet store or vet's office. Some owners also like to rub vitamin E or fish oil into the dog's skin to help heal it from the outside. Bring your dog to the vet to have him checked for parasites other than fleas. Ringworm and yeast infections can both cause itching in dogs, but you will need to get medication from the vet to treat them.